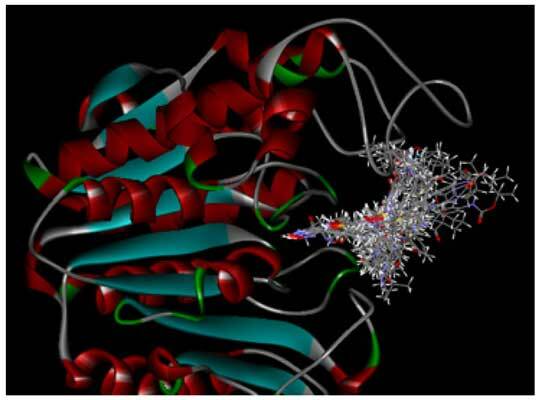 Background: A 3D-QSAR study of histone deacetylase 6 (HDAC6) inhibitors including comparative molecular field analysis (CoMFA) and comparative molecular similarity index analysis (CoMSIA) was carried out. Method: Sixty-six compounds with their in vitro inhibitory activities (IC50 values) were first docked into a homology model of HDAC6 using the LibDock program and then used to generate the training and testing sets of compounds for both the CoMFA and CoMSIA studies. Results and Conclusion: The best CoMFA model produced a q2 of 0.637 and an r2 of 0.987, and the best CoMSIA model produced a q2 of 0.767 and an r2 of 0.987, indicating a high statistical significance as a predictive model. The models and related information may provide important insight into inhibitor–HDAC6 interactions and help in the design of novel potent HDAC inhibitors. Keywords: HDAC6 inhibitors, 3D-QSAR, docking-based alignment, CoMFA, CoMSIA, compounds. Keywords:HDAC6 inhibitors, 3D-QSAR, docking-based alignment, CoMFA, CoMSIA, compounds. Abstract:Background: A 3D-QSAR study of histone deacetylase 6 (HDAC6) inhibitors including comparative molecular field analysis (CoMFA) and comparative molecular similarity index analysis (CoMSIA) was carried out.